Danger High Voltage is a 6 reel and 4,096 ways to win slot game powered by Big Time Gaming! This slot is themed on the hit songs of the famous rock band, Electric Six. Rock out while the you spin the reels of Danger High Voltage at Vegas Spins Casino! On the reels, symbols you will find correspond to lyrics of the songs. Trigger winning combinations with symbols like Glitter Balls, Tacos, Bells, Skulls, Hearts and low value cards. Winning combinations are created from left to right of the slot grid. 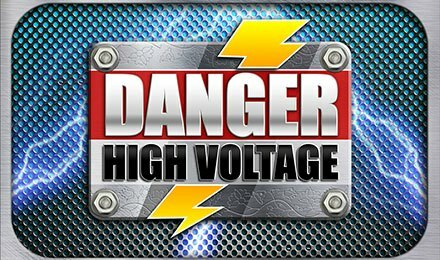 Danger High Voltage comes packed with 4,096 ways to win, where the highest payouts are triggered during the free spins features. Use the autoplay option to help you proceed with your gameplay handsfree! This is done by selecting several auto spins. The wild symbol of this slot game is represented by the WILD logo, which replaces all other symbols bar the scatter symbol. The bonus scatter symbol is the desire heart, which triggers bonus rounds when three or more of them land anywhere on the reels. When the feature is triggered, seven free spins are awarded. Watch out for the symbol reel, which selects one specific symbol and becomes sticky throughout the free spins feature. Retrigger up to 19 free spins in Gates of Hell Free Spins. Get your hands on 3 or more ‘My Desire’ logos to seize 15 free spins. Full wild reels and multipliers come into play, and can award you up to 66x your stake value. The feature is re-triggerable, and an unlimited amount of free spins can be won. Get ready to rock and roll at Vegas Spins Casino, and enjoy the great gaming experience you get to gather from this. You can play this game on your mobile, desktop or tablet.